Any device that has data sent to it at the network layer will have at least one IP address: one per network interface. As I mentioned above, this means that normal hosts such as computers and network-capable printers usually get one IP address, while routers get more than one IP address. Some special hosts may have more than one IP address if they are multihomedconnected to more than one network. Lower-level network interconnection devices such as repeaters, bridges and switches don't require an IP address because they pass traffic based on layer two (data link layer) addresses. Network segments connected by bridges and switches form a single broadcast domain and any devices on them can send data to each other directly without routing. To the Internet Protocol, these devices are invisible, they are no more significant than the wires that connect devices together (with a couple of exceptions). Such devices may, however, optionally have an IP address for management purposes. In this regard, they are acting like a regular host on the network. See Figure 55 for an illustration. This illustration shows the IP interfaces of a few common of LAN devices as small cyan circles. Each regular host has one interface, while the router that serves this LAN has three, since it connects to three different networks. 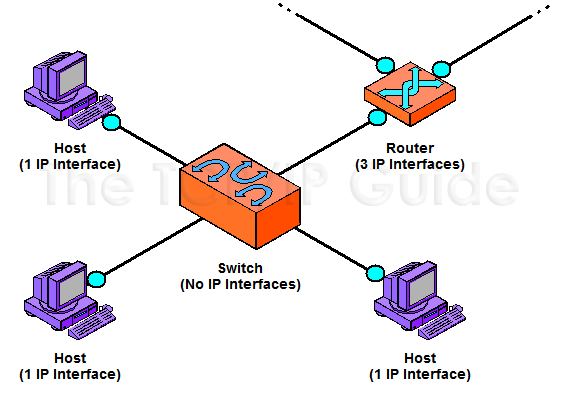 Note that the LAN switch has no IP interfaces; it connects the hosts and router at layer two. Also see Figure 59, which shows the IP interfaces of devices in a more complex configuration. Since IP addresses represent network interfaces and are used for routing, the IP address is specific to the network to which it is connected. If the device moves to a new network, the IP address will usually have to change as well. For the full reason why, see the discussion of basic IP address structure. This issue was a primary motivation for the creation of Mobile IP. IP addresses are used for network-layer data delivery across an internetwork. This makes IP addresses quite different from the data link layer address of a device, such as its Ethernet MAC address. (In TCP/IP parlance these are sometimes called physical addresses or hardware addresses.) At the network layer, a single datagram may be sent from device A to device B. However, the actual delivery of the datagram may require that it passes through a dozen or more physical devices, if A and B are not on the same network. It is also necessary to provide a function that maps between IP and data link layer addresses. In TCP/IP this is the job of the Address Resolution Protocol (ARP).